Sous Vide Unlimited – the final app you will ever need. 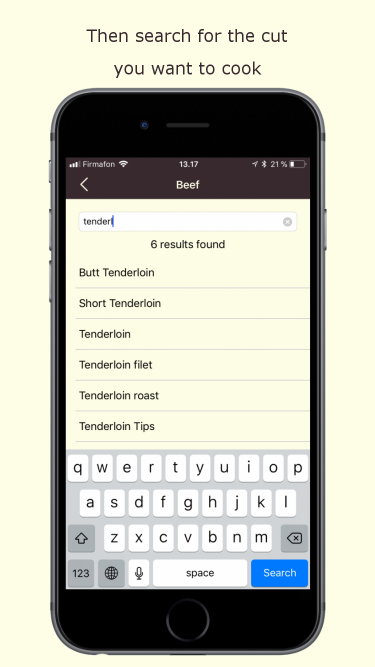 – The final Sous Vide APP you will ever need. The only SousVide APP you will ever need. The SousVide Unlimited APP is made by Danish Sous Vide enthusiasts and fine dining cooks with the goal for you to make the best meal ever. 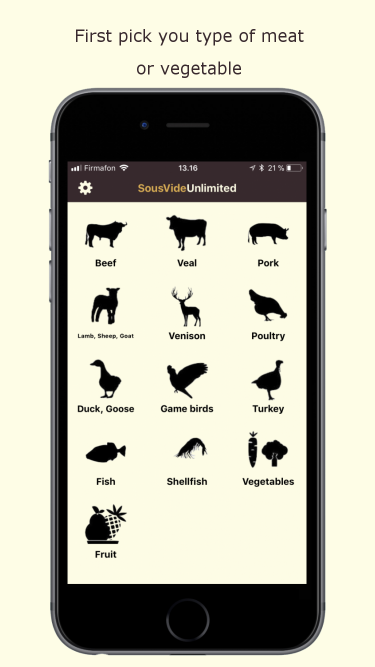 The SousVide Unlimited APP is probably the last APP you will ever need for your Sous Vide fine dinning, with more than 2300 names for meat cuts, fish, vegetables and for each several times and degrees in the database you will probably find exactly what you need. And more cuts will be added frequently. Available in English and Danish with text and names for cuts. More languages will be added. The entrys in the database used by the APP are validated by danish sous vide cooks, we just dont calculate our entrys, we test them over and over again to find the best results for you to explore the world of Sous Vide, to make your success in the kitchen, to make you become a masterchef. We have build this APP as the one we our self wished for, to extend the limits of ours and yours fine dinning cooking. As we will add more cuts, times and degrees, will we also futher develop the APP with more functions, we have a large idea catalog of extra functions for the APP, but would also invite you to provide us with your feedback and new ideas. - the team behind SousVide Unlimited. Sous Vide cooking is total control of the result of you cooking, you can very precise cook you meal to the level of doneness that you want. If you want a piece of meat rare, medium-rare og well-done and do not want to guess when its ready, testing with thermometers, cutting slices or poking it with you finger this is the way. Sous Vide gives you perfect results every time, and in all parts of you meal. Sous Vide can be planned and offers you more flexibility in creating your fine dining cooking. Basicly Sous Vide is a heated water bath, you control the exact temperature of the water, and the time your meal is in the bath, and therefor you have full control of the final result. You start with putting you meal in a vacuum bag, or wrap it firmly in film, and then just give it time in you water bath. Often when we talk about meat, would you often finish off by giving it a short time on a warm grill or a pan to give it the right color and caramelizing. Sous Vide tools comes in sticks, which you can put in almost every waterproof container or as a tub with built-in heating and temperature devices. Both variants gives you the perfect result every time. 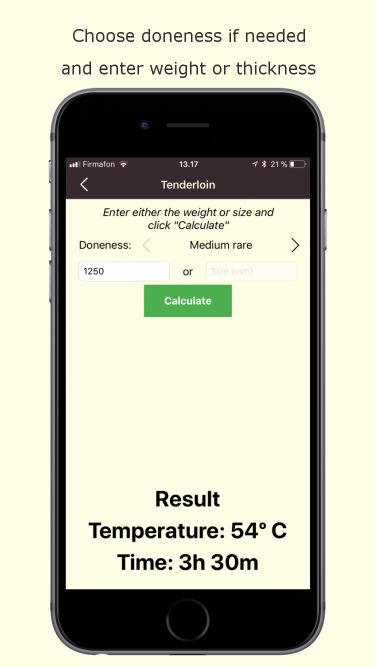 And with the assistance of our Sous Vide Unlimited APP will you not need to guess what temperature and time you meal has to be prepared, the APP delivers our suggestion to the right degrees and the time for the cut you want to you meal. The term Sous Vide is french and means ”under vacuum”. The way of heating food this way was first presented in the late 1700´s, in the 1960´s the vacuum method of preparing food was invented, and in the 1970´s french cooks started to use this way to create the most fantastic meals. The later years, the general public has discovered this way of cooking, a secret only the best restaurants kept for themselves. The Sous Vide method of cooking is used in a lot of high-end gourmet restaurants in the world. With the Sous Vide Unlimited APP things just got easier. Please send us you feedback, we will love to hear about your experiance with the APP, and if you got other inputs or questions.